Fifa has released tv figures from the 2018 World Cup in Russia. France celebrate winning the World Cup. 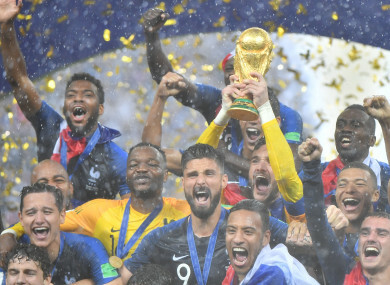 A survey it had commissioned by Fifa found that 3.04 billion viewers caught at least three minutes, a 10.9 per cent increase on Brazil 2014, and 2.49 billion watched at least 30 minutes, or one third of one match, up on 2014′s 1.95 billion. Email “'More than half of the global population' tuned into record-breaking World Cup”. Feedback on “'More than half of the global population' tuned into record-breaking World Cup”.